Learn how to maintain and repair popular pistols and revolvers with the instruction presented by Patrick Sweeney in this gunsmithing book. Category Gunsmithing SKU:: T4654-m Format:Digital Book (PDF), Paperback ISBN: 9781440242960. 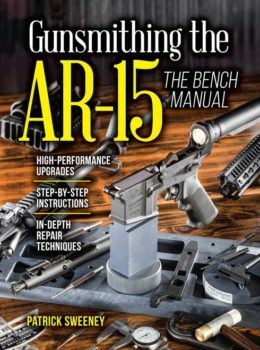 Working on your own guns can be both fun and economical, and in this all-new fourth edition of Gunsmithing Pistols & Revolvers, certified master gunsmith and best-selling gun writer Patrick Sweeney shows you how to avoid costly repairs and improve your handgun’s performance. Hundreds of photographs give step-by-step instructions on how to perform basic maintenance and repairs on a variety of popular pistols and revolvers. Professional gunsmiths typically charge $50-75 per hour for the same services and repairs detailed in Gunsmithing Pistols & Revolvers, 4th Edition. Sweeney shows you how to save that money by cleaning, polishing, and making minor repairs on your pistols and revolvers. About the author: Patrick Sweeney is a certified master gunsmith, columnist for Guns & Ammo magazine, competitive shooter, and Gun Digest’s single best-selling author. His other books include Gun Digest Book of the 1911 Vols. 1 & 2, Gun Digest Book of the Glock Vols. 1 & 2, Gun Digest Book of the AR-15 Vols. 1, 2, 3 & 4, Gunsmithing Rifles, and Gunsmithing Pistols & Revolvers. Upon purchase you will receive ePub and PDF versions of this title.